In stock -This product will ship today if ordered within the next 1 hours and 47 minutes. For Dry, Damaged & Processed Hair, PhytoCellTec Alpine Rose Stem Cells uplift as rosehip and pomegranate oils condition to help smooth and shield strands from fading, split ends, and frizz. The result is noticeably softer, fuller looking hair with lasting shine. Aloe Barbadensis Leaf Juice*, Purified Water (Aqua), Vegetable Glycerin, Cetyl Alcohol, Stearyl Alcohol, Behentrimonium Chloride, Theobroma Cacao (Cocoa) Seed Butter*, Rosa Canina (Rosehip) Fruit Oil*, Hydrolyzed Rice Protein, Panthenol, Plant Stem Cells (Alpine Rose, Malus Domestica, Solar Vitis) and BioActive 8 Berry Complex*, Rosa Damascena (Rose) Flower Distillate*, Punica Granatum (Pomegranate) Seed Oil*, Cocos Nucifera (Coconut) Oil (and) Gardenia Tahitensis Flower Extract, Hydrolyzed Linseed (Flax) Extract, Butyrospermum Parkii (Shea) Butter*+, Glyceryl Stearate, Amodimethicone, Aspalathus Linearis (Rooibos) Extract*+, Camellia Sinensis (White Tea) Leaf Extract*+, Tocopherol, Sodium Benzoate, Lactic Acid, Potassium Sorbate, Ethylhexylglycerin, Rose Isolates, Vanilla Isolates, Pelargonium Graveolens (Rose Geranium) Flower Oil*, Citrus Aurantium Dulcis (Orange) Peel Oil*. 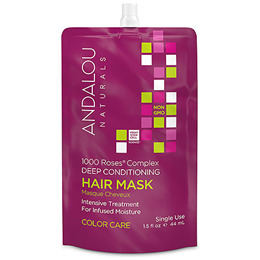 Apply evenly to clean, damp hair working from roots to tips. Leave for 3-5 minutes, rinse thoroughly and style as usual. Extra benefits for all hair types, especially dry, damaged, and processed. Gentle and colour safe. 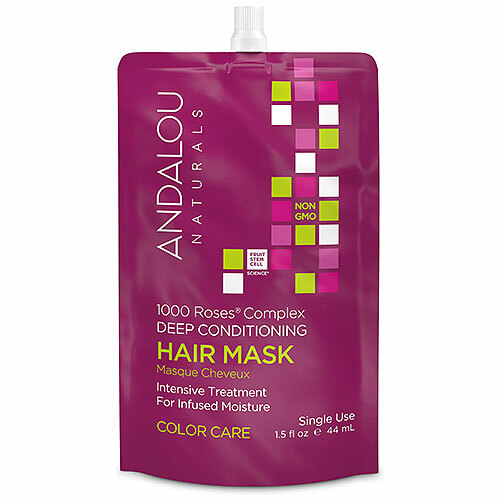 Below are reviews of Andalou 1000 Roses Deep Conditioning Hair Mask - 44ml by bodykind customers. If you have tried this product we'd love to hear what you think so please leave a review. Lovely treat for the hair - felt very rich and creamy. For Dry, Damaged & Processed Hair, PhytoCellTec Alpine Rose Stem Cells uplift, as rosehip and pomegranate oils condition to help smooth and shield strands from fading, split ends, and frizz.